For Mighty Girl books about girls who love to explore the great outdoors, check out our blog post, 25 Mighty Girl Books About Outdoor Discovery, or browse our entire Animals & Nature book collection. Water a garden or have fun digging up discoveries at the beach or sandbox — there are plenty of possibilities with this set from Green Toys! 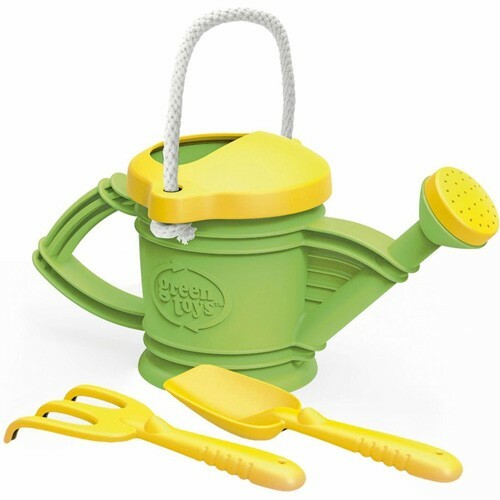 This watering can has an easy pour spout and a rope handle that prevent little gardeners from getting frustrated. It also comes with a hand rake and a trowel for digging and weeding. Kids will love the bright colors and the play potential, while parents will particularly appreciate the eco-conscious construction — like all Green Toys, it's made from 100% recycled post-consumer plastic and colored with soy inks. 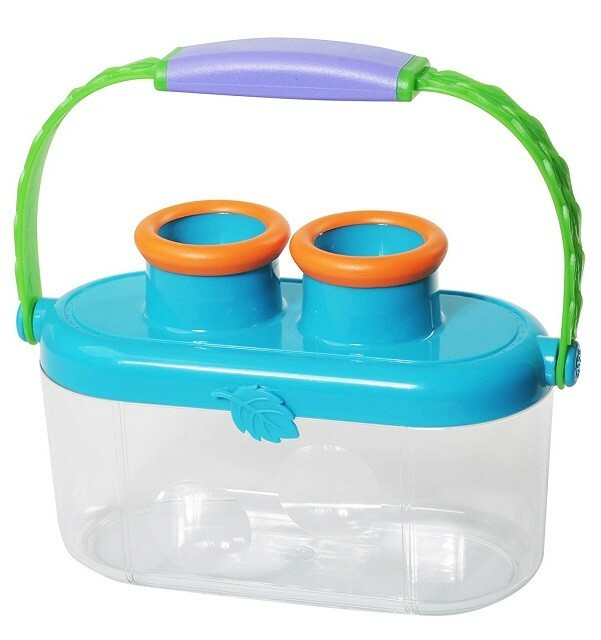 This unique bug collection container allows kids to catch bugs and then examine them easily with built-in 3X magnification on the top and 2X magnification on the sides! The Bugnoculars have a soft, rubber grip handle and a snap-lock lid with built in air holes, so it's easy to carry and safe for its inhabitants. They're even waterproof, so curious kids can examine fish, tadpoles, and other water creatures before releasing them. 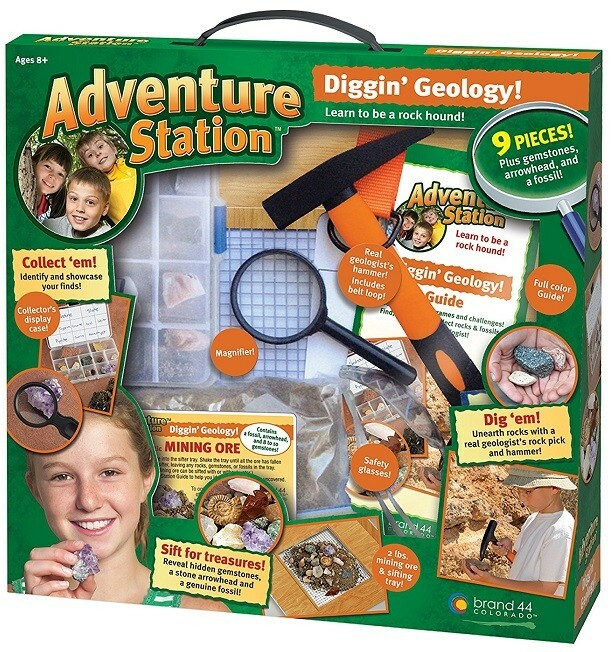 This toy is a great tool to encourage a lifelong love of science. 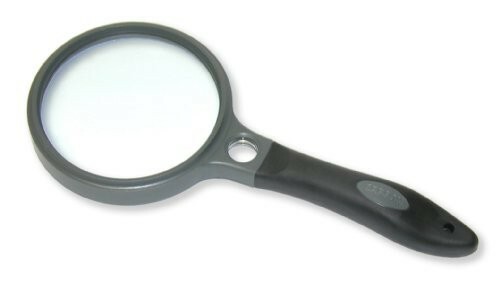 This high-quality magnifier is perfect for investigating all sorts of things in your environment! A soft-grip handle makes it comfortable in the hand and easy to hold onto as you explore, while the high quality glass lens is crystal clear. With 2X magnification for most of the glass, and a 10X magnification spot lens, you can get a new perspective on the natural world around your home. It even comes in a zippered, padded case for safe and simple storage and transportation. 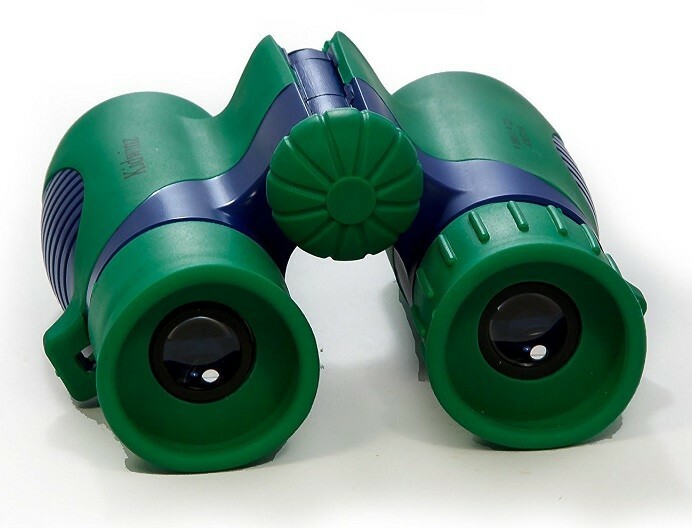 These binoculars are perfectly designed for little kids! The large focus-free eyepieces and perfect-fit goggles make it easy for kids to line up the binoculars for a good view, while the breakaway neckstrap ensures kids' safety even if they manage to get the strap tangled. With 2X magnification, they provide enough of a change to make a difference while still making it easy for younger kids to connect what they see through the binoculars with what they see unmagnified. Plus, they're built tough, so they can handle being dragged on all your Mighty Girl's outdoor adventures! 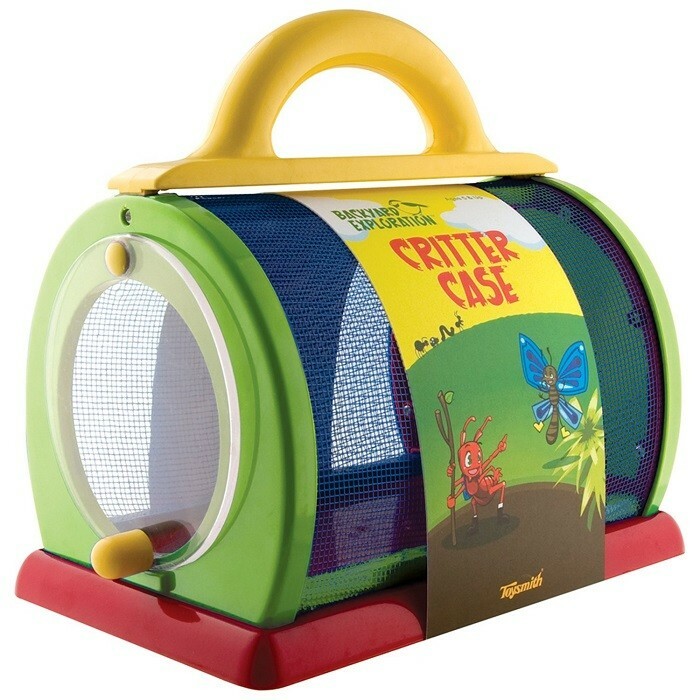 Have fun catching bugs and butterflies with this fun bug net from Melissa and Doug's Sunny Patch collection! This child-sized bug net has a striped wooden handle and a high quality polyester mesh net that's sturdy enough to hold up to your child's enthusiasm. The fade-resistant materials and finishes ensure it will still be bright and cheerful even after plenty of use. It's sure to encourage plenty of active play and get kids interested in learning more about the insect world. Your budding gardener will love this garden tote with real garden hand tools, properly sized for a child's hands! 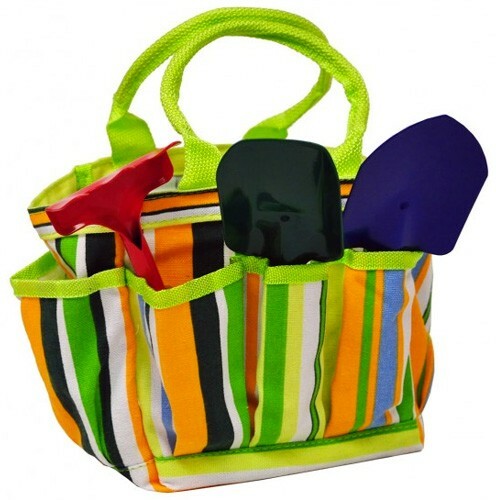 This colorful set comes with a trowel, rake, and shovel, all with metal blades and wooden handles, as well as a colorful canvas tote with plenty of extra room for other things she needs. They're perfect for working alongside an adult or for cultivating her own little patch. Toysmith also makes a child-sized set of large garden tools that includes a garden rake, a spade shovel, a leaf rake, and a hoe, for ages 4 to 12. Add this pair of gripping garden gloves for ages 2 to 5 and she'll be all ready for planting season! With these shockproof binoculars, kids will have a high quality but sturdy set for hiking, stargazing, birdwatching, and more! These compact 8X magnification binoculars have an easy-to-use folding mechanism that allows kids to adjust them for their own eye width. Rubber surrounded eyepieces ensure kids don't hurt their eyes or face, while the 2 foot neckstrap keeps them close to hand when needed. This set even comes with a cleaning cloth and a case for carrying and storage. Explore the world of plants, bugs, and more with this set from Learning Resource's Primary Science line! These are real scientific tools, sized for kids and made of sturdy materials that can hold up to hard use. 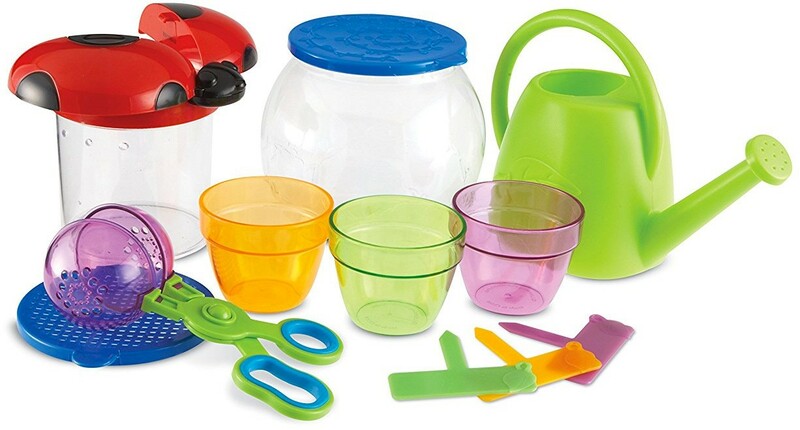 The set comes with sprouting jar with two lids, a watering can, three plant pots with markers, a Big View bug jar, and a set of Handy Scoopers. Plus, an included set of ten double-sided activity cards provides plenty of fodder to get your little scientist investigating the outdoors. Get ready to dig into geology with a rock hammer that's just her size! This geological hammer is lightweight enough for a young child to swing, and features a shorter handle and chisel points that have been dulled slightly for safety. 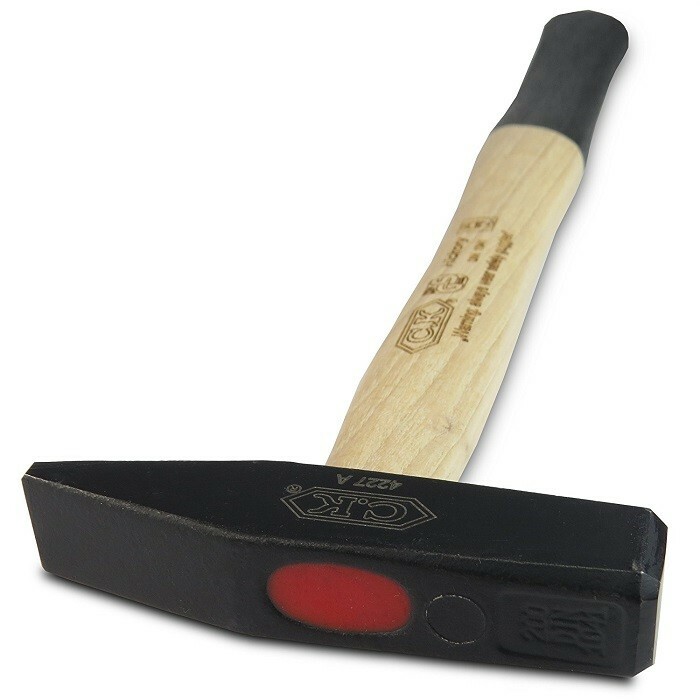 The high quality steel in the head and the hickory handle ensure that it's tough enough to handle serious use. It's the perfect choice for budding rock hounds! 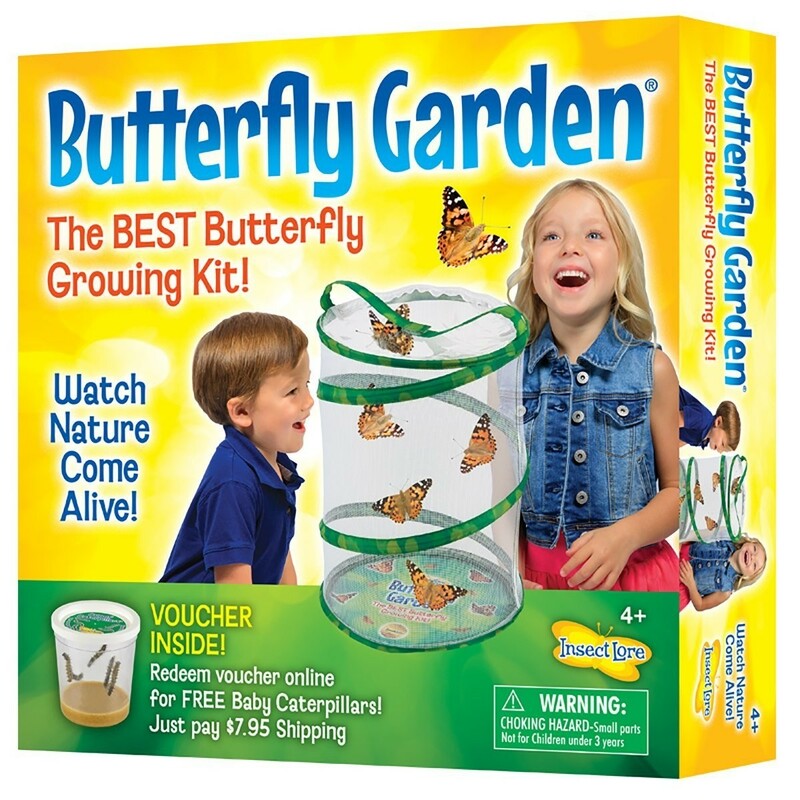 You can watch the amazing phenomenon of metamorphosis up close with this kit from Insect Lore! This reusable butterfly habitat is made of a fine transparent mesh that makes it easy to observe the changes going on inside. Send off your certificate to receive caterpillars and food, then set up the easy-to-use feeder so your caterpillars can grow. Soon enough you'll get to watch them form a chrysalis and then emerge as painted lady butterflies that you can release into your own garden! The habitat collapses for storage, but you can use it as many times as you want to observe caterpillars, butterflies, and other insects around your home. Kids can enjoy the outdoors and foster a love of gardening with this set of large garden tools! These are real garden tools sized for younger kids, so they can actually tend their own plot — or work side by side with you. 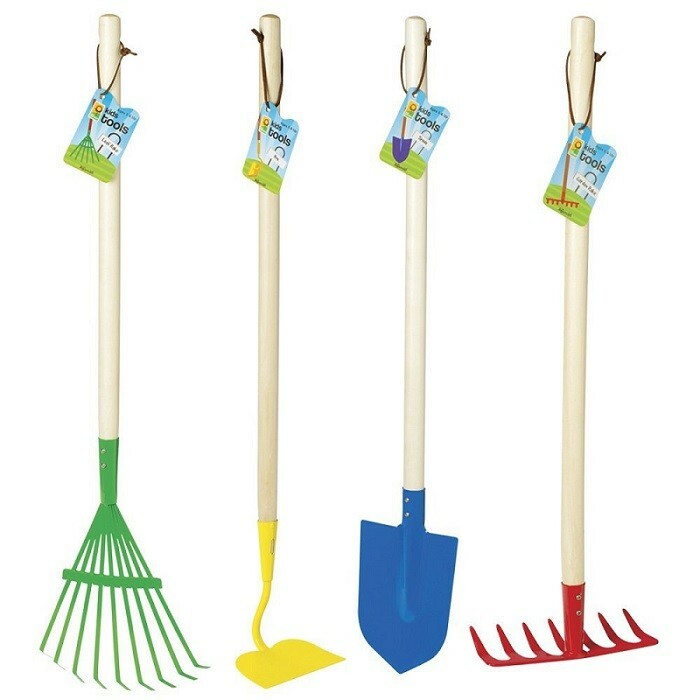 The set includes a garden rake, a shovel, a leaf rake, and a hoe, all with 27.5" handles. With colorful metal tools on durable hardwood handles, this set should last until she's ready for adult sized gardening tools. 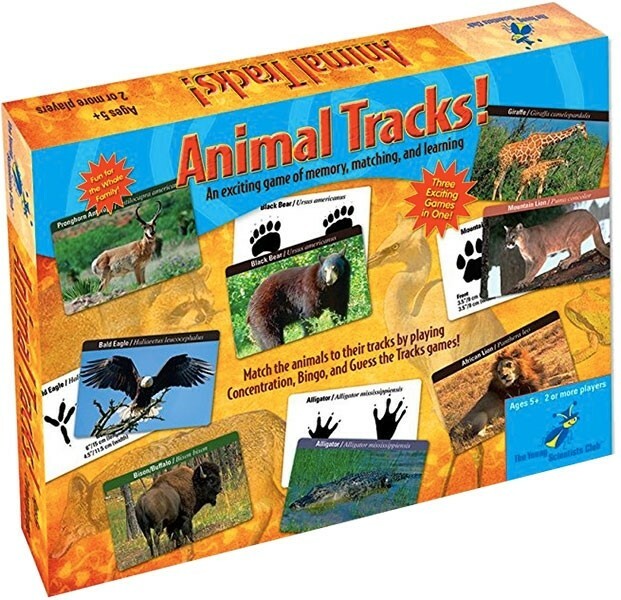 Kids love being able to spot the tracks of the animals that passed by, and this fun and educational game can help them identify them all! High quality cards depict animal photography, including both their common and biological names, as well as their tracks. Kids can then play three traditional games with a science-based twist as they remember and match the animals and tracks. After the game, the real fun begins: get outside and figure out which of those animals leave tracks in your area! With forty different animals from all over the world, kids will have plenty to learn and explore with this game. Join Ms. Frizzle and the gang as they check out all the wonders of the natural world! Build a bug house, cast an animal track, learn about the life cycle, dry flowers, and more with the activities and supplies in this kit from the Young Scientist Club series. Many supplies are included, but some you'll have to collect yourself! Activities like the nature scavenger hunt also encourage kids to get outside and get studying. Seatbelts, everyone! Safely keep your insect subjects for longer-term study with this handy Critter Case! The plastic frame and easy-carry handle makes this case suitable to take both outdoors and in, while the high-quality mesh fabric on the sides allows easy observation of your insect finds. The hatch on the side allows you to set up a comfortable environment with branches, leaves, and so on to make your specimens feel at home, while the flat bottom keeps it stable and allows you to display it on a table or desk. It's the perfect choice for a budding entomologist. Take science outdoors with the ideas in this fun lab field kit! The kit includes a field journal with 14 different ideas for scientific activities, from building a pit trap to catch insects to creating a backyard wildlife habitat, as well as space or your own observations and ideas. To complement the journal, you'll get two lab pens that are much more than writing tools — the land pen features a collection vial, built-in tweezers, and a ruler for specimen observation, while the water pen features a liquid specimen vial with volume markings, built-in dropper, and thermometer. 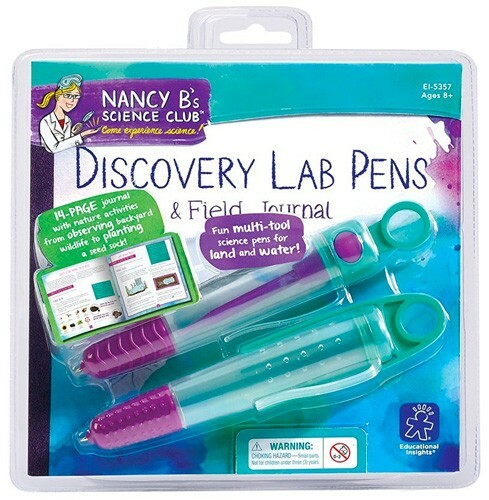 Together, they make the perfect starter set for outdoor scientific discovery. 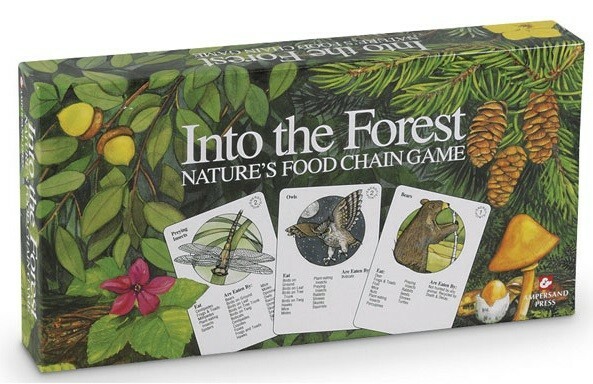 Prepare for your forest excursions with this game that teaches the concept of the food chain! On each plant or animal card in this game you'll find a detailed illustration and a list of what it eats... and what eats it. Play along to reinforce how the food chain works — including the importance of plants and plant energy — and learn the relationships between different life forms in the forest ecosystem. This game for 2 to 6 players comes with info cards, a food web chart, a scoring pad, and instructions. You'll be amazed at what you can see with this black light illuminator! Kids will be fascinated to discover that there are rocks, minerals, and plants that actually glow under the black light. 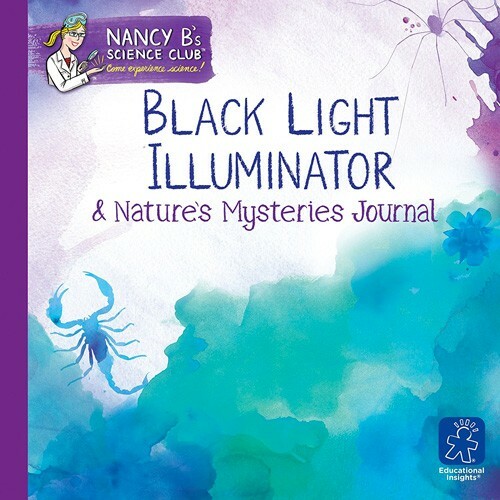 The 22-page Nature's Mysteries Journal provides a wide range of activities to encourage her love of science, as well as introduce her to other activities like detecting counterfeit money and solving codes and ciphers. She can even write secret notes with the black light illuminator invisible ink pen! It's sure to give her a unique perspective on the world around her. Discover the universe around you at any time of night, any day of the year, with this easy to use star wheel! 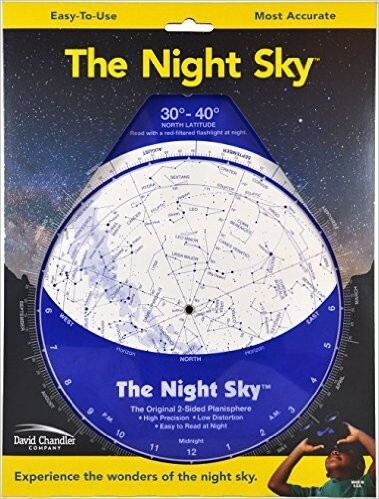 This accurate, rotating star map allows you to locate and identify individual stars and full constellations quickly, The 8" diameter makes it easy to see the stars and their names, while the sturdy construction ensures you can take it out for many nights of stargazing. This edition covers 30° to 40° of latitude, which covers the southern half of the United States; this 40° to 50° of latitude edition covers the northern half of the United States and parts of Europe. Let your budding botanist explore the world of plants with this fun set! Pick a tree to "adopt" for a year and preserve its leaves and flowers with the Nature Keeper press, as well as any other plant specimens she'd like to keep. 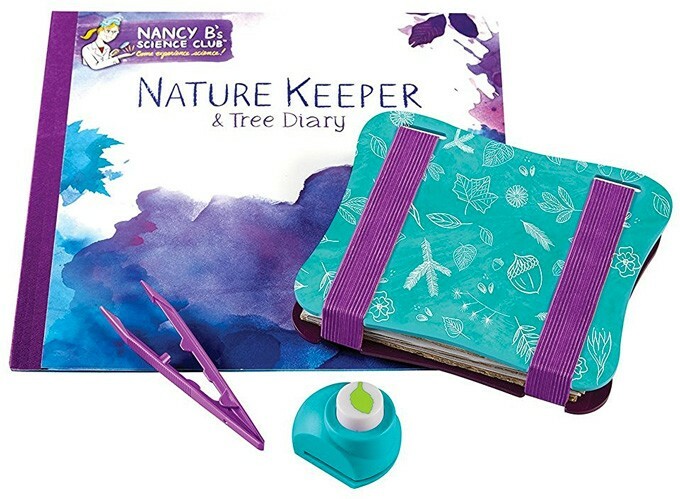 Then, use the accompanying tree diary to record interesting details like what animals visit and how its environment changes with time, as well as making leaf art and even scientifically estimating your tree's age. It's a unique look at how one tree spends a year of its life. Learn how to be an expert rock collector with this kit from Brand 44. A real rock hammer and pick are included for excavating and breaking interesting rocks and minerals — and don't forget to wear the included safety glasses! The set includes two pounds of mining ore that are concealing ten to twelve gemstones, a fossil, and an arrowhead; use the sifter to unearth them. Then, display your new specimens in the collector's case. When she's done with this kit, she'll be ready to set out and expand her collection with her own discoveries! 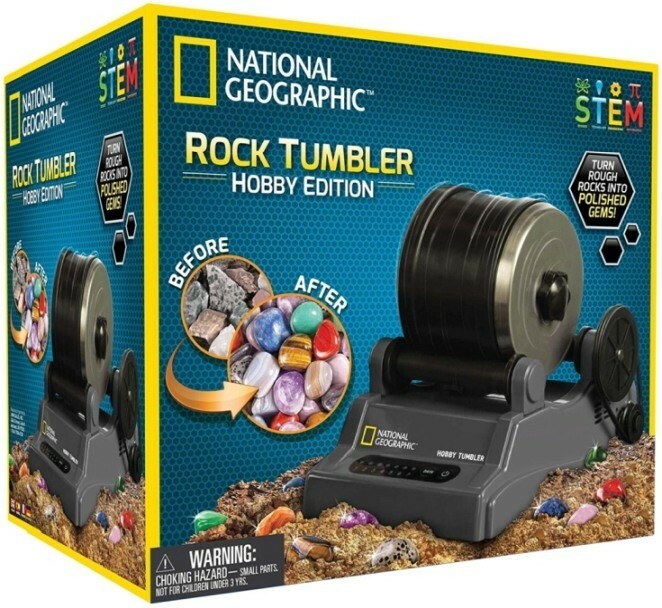 See the true beauty of the gems you find with this high-quality rock tumbler! This set from National Geographic has an automatic shutoff timer, so it will run for just the right length of time, and a rubber barrel that reduces noise, making it a pleasure to use. It comes with 0.5 lb of assorted stones to get you started, but every rock hound knows the real fun will begin when she gets outside and hunts down her own! With the BugView you can easily and humanely examine insects and other small wildlife! 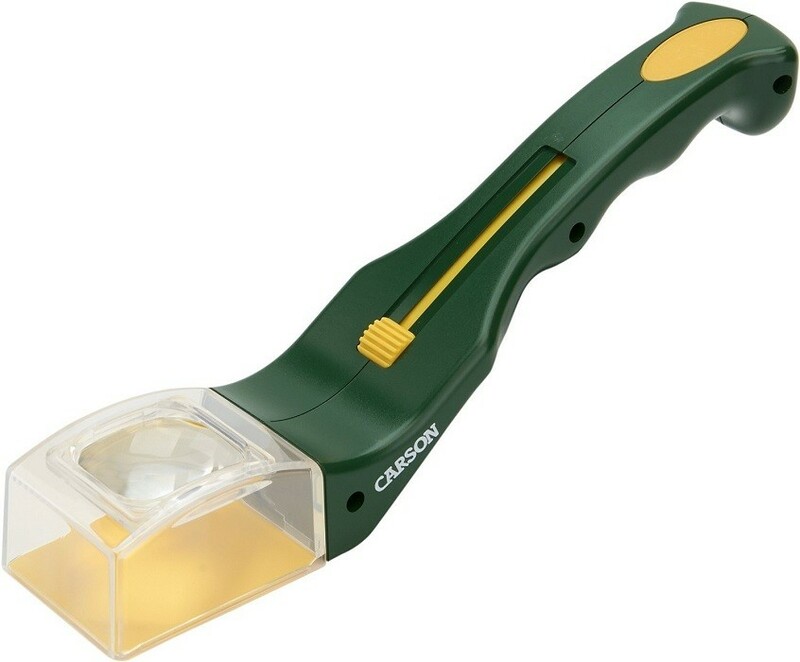 The 2 by 2 1/2 inch opening allows you to coax a variety of small creatures into the catcher, and the thumb-operated trapping slider makes it easy to catch even the fastest specimens. Then, use the built-in 5X magnifier to see with fine detail. When you're done, a flick of the thumb allows you to release the insect gently back into its environment. It's a great choice for older kids and adults to use both inside and out. Get your budding astronomer started with this entry-level kit from Thames and Kosmos. 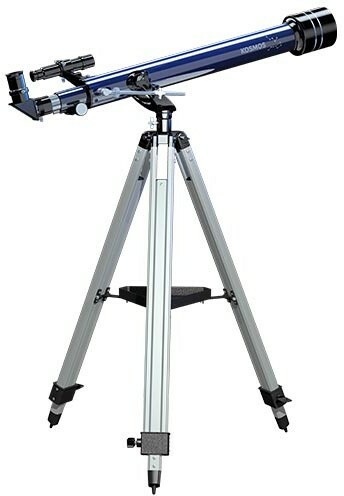 This high-quality refractor telescope features coated glass optics and includes plenty of accessories to get your observations started, including a stand and a variety of eyepieces for different purposes. The included guide teaches you how to properly care for and view through your telescope. 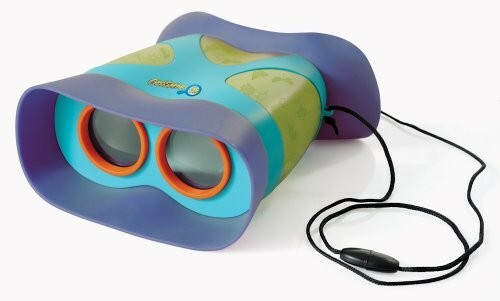 With a maximum magnification of 140X, kids can easily view the planets, their moons, and several galaxies and nebulae. She'll be amazed to see all the wonders of the night sky. For more toys to encourage outdoor fun of all kinds, visit our Outdoor Play Collection. For books that celebrate the fun of outdoor play, check out our blog Explore Your World: 25 Mighty Girl Books About Outdoor Discovery. For biographies and fiction starring female scientists, check out our blog Celebrating Science: 50 Books to Inspire Science-Loving Mighty Girls.